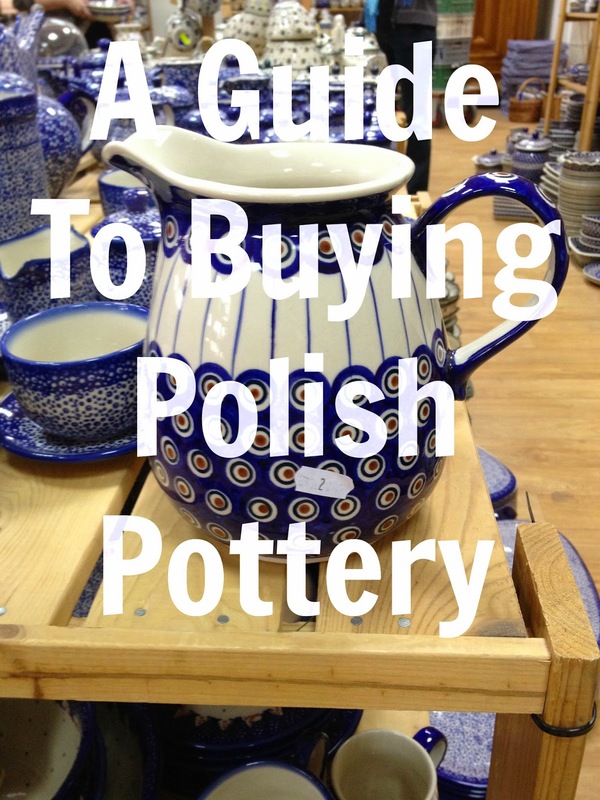 So, you've traveled all the way to this remote part of Poland for a pottery buying extravaganza. You only have two days, maybe even less? Well, don't worry, because with the following tips you are going to be organized, quick and buy way more than you had anticipated (at least I did)! Truly, I had intended to buy a couple of serving dishes because honestly, I need more dishes like I need a hole in the head, but guess what--my husband called me on the road and said, "Splurge! This is your one chance, buy more, not less!" How often do you get that kind of permission? Naturally, I complied with his instructions. This list is intended to help you be organized as you shop because, if this is your first time to Boleslawiec, it can be overwhelming. The sheer number of patterns, sizes and dishes is incredible, way more than you've ever seen before, so memorize this list--and get ready for some fun retail therapy! All pottery pics were snagged from Carla's blog because I was too busy shopping to actually take pictures. 1. Come with an idea of what you need or want to purchase. It is very likely you will still make a few impulse purchases, but it will be easier to keep yourself in check if you have a plan beforehand. 2. Start early: plan to visit stores as they open--Most stores open at 10:00am and close at 5:00pm, but some open as early as 7:00am and close as early as 4:00pm. You'll want to hit those early openers first thing so that if you need to go back later in the day you can. 3. Head straight for the Tourist Information center and get a list of the stores. It is a spreadsheet with addresses and opening hours of all the stores. 4. Spend a few hours visiting as many shops as possible to familiarize yourself with patterns. DO NOT BUY, JUST LOOK! 5. TIME: Use your time wisely, there are many stores to get to. Some of our favorites were towards the end of the day when time was running out. 6. During the "look not buy" phase, take a picture of the store front as you enter and any pieces you like inside that store--Trust me, you will forget. 7. Take pictures of what you buy--you will forget! When I unwrapped all my purchases (at home and too late) I realized I was a bit lopsided in one pattern. 8. Carry a sharpie marker with you and name your bags. Once is it all wrapped up you can't tell which bag belongs to whom. 9. Build a few extra bucks into your budget to allow for the impulse purchase. 10. Stores take euros, dollars or polish zloty, cash or credit--they will perform the exchange rate right there in front of you. All shop owners calculate the same way, you can feel safe you are getting a fair deal. 11. Understand the 1-5 rating system. Simply put, 1 is perfect and the most expensive, 5 is the least expensive, but for decorative purposes only. Pottery rated 1-4 is dishwasher safe, oven save, microwave safe and yes, you can cook in it and eat off of it. 12. In general, the more color and more pattern on a piece of pottery, the more expensive it will be. Unikat means one of a kind and will be more expensive. 13. Take the Manufaktura Factory tour. You will see the entire process up close and personal. From start to finish you will see pottery being molded, smoothed, painted, glazed and fired. Best of all, it only costs about €1.50.